I was away from this platform for a couple of weeks and not even working my business. The wonderful thing about my niche is my investments are consistently growing and also getting paid based on the work I invested. It was time to focus on family. My oldest daughter was pregnant and on her last trimester, she was considered high risk. It was really a trying time on my inner bean, as a mother that inner strength kicks into action. She was hospitalized for about 6 weeks. Hooked up to every equipment, not able to move and could only give me a smile at times. There were so many sleepless nights, long days at the hospital hoping the baby would stay inside of her a little longer. On the other hand, I did not want to get that dreaded phone call at night saying something went wrong with either mother or child. One day while visiting my daughter she utters these words to me, "Ma I has made peace with death." She just could not take the constant pain and high blood pressure anymore. With my eyes filled with tears and have to hold them back and make sure I keep my composure. My reply was absolutely not, you have to fight to stay alive for you, the baby and your older two boys. As the days go by her eyes was reflecting her weakness. It's so important to have a supporting team in good and especially challenging times. Betty my best girlfriend who would stay on the phone day and night. My daughter girlfriend Ptah would give her baths and massages to help with her circulation. Miss Thomas, grandma would make sure she has a fresh meal daily. I thank all these strong, supporting women. Finally, it came that afternoon the body could not hold the baby in any longer. I recall saying to her the baby heartbeat is dropping very low, after being in the hospital for such a long time one tends to be able to read the machines. Within a second there were about three doctors and lots of nurses gathered and said to me a baby was about to be born. Our beautiful bundle was born 3lbs and her name is Majesty. While she was being delivered my daughter died for a few minutes. The amazing doctors at the hospital were able to resuscitate her for which I am truly grateful. Majesty is doing much better developing slowly after spending a month in the hospital for this I am also grateful. 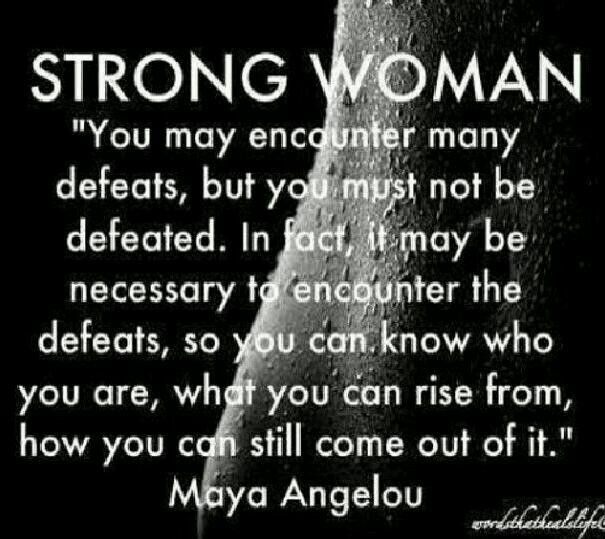 Fantastic quote by Maya Angelou and thank you for sharing your inspirational and motivational story. It's truly amazing to see the strength we all have inside us. God gives us the strength when it's time. Your daughter is stronger from her experience and now she can share it with her daughter.